Finally, WordPress is upgraded to 5.0 version. The core update brought revolutionary changes in the post editor and converted its classic style to a block-based editor. The Gutenberg editor gives you full control over the content layouts and lets you design it as you like. A number of blocks are introduced to manage different parts of the posts like headings, paragraph, lists, image, gallery, quote, and so on. They are easy to apply and provide a professional level editing experience across your site. In this short guide, we’ll tell you how to use the new WordPress Gutenberg editor quickly. Click the ‘Add title’ block to enter your blog post title. Click the second block to type your content. When you finished a paragraph, just hit enter in the keyboard to create and go to the next paragraph directly. Type as usual and hit enter whenever you want to divide contents into different paragraphs. It is a paragraph block that WordPress creates automatically. Click the image icon to upload a new image or choose it from your media library. Follow the onscreen instructions to upload and use it in your posts. Place your cursor where you want to create a sub-heading (check the last screenshot). Click the ‘+’ symbol from the left-end to add a new block. Choose ‘Heading’ from the block types. Type your texts as headings and a small box will appear with formatting options. Assign a heading tag and make it ‘Bold‘ or ‘Italic‘ if needed. Check the right pane of your Gutenberg post editor. 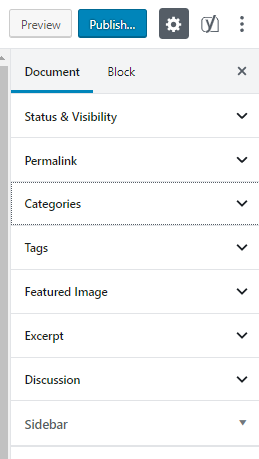 Choose the ‘Document’ tab to view post visibility, categories, tags, featured image, discussion, and other sections. Click those sections that you want to customize and they will be expanded. Choose category names from the ‘Categories’ menu and type tag names in the ‘Tags’ menu for your content. Expand ‘Featured Image’ menu to upload and set the image, for your content feeds and social media shares. ‘Discussion’ is another section where you can enable or disable comments, pingbacks, and trackbacks for individual posts. When completed, tap ‘Preview’ button from the top-right side to take a quick look of your post. Click ‘Publish’ button to publish the content. Are you upgraded to WordPress 5.0? 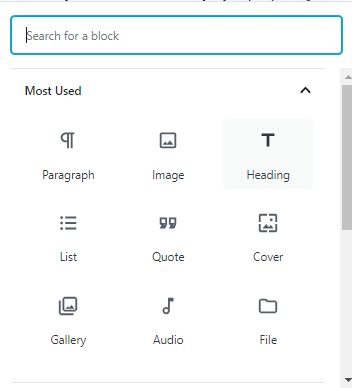 How is your new Gutenberg editor experience? Feel free to share your thoughts through the comments.